I was provided with a complimentary digital download of this movie in order to facilitate my review. All thoughts and opinions are my own. Now available on Blu-ray 3D™, Blu-ray™ Combo Pack, DVD and Digital HD! Every Friday night in our home is family movie night where we watch something new together. It's a really nice tradition of pizza for dinner followed by whatever new family friendly movie we can find and some freshly popped organic popcorn. 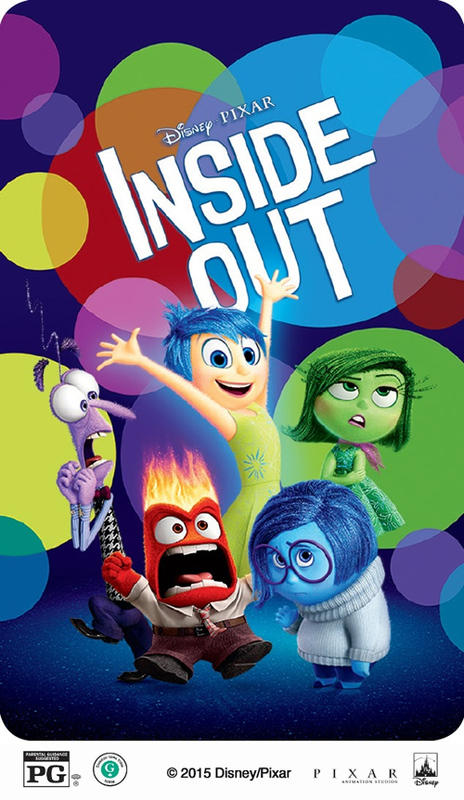 This past Friday we finally got the chance to watch Disney-Pixar's Inside Out for the first time. We have been wanting to watch this one since it released in theaters in June, so the boys were absolutely thrilled.And with a great cast of voices, as usual for Disney-Pixar, I was excited too! 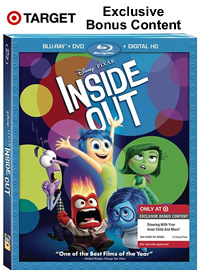 Disney-Pixar's Inside Out is about 11 year old Riley and the emotions that are inside her head controlling her actions and reactions. It was defintely an interesting and fun take on human emotions that we got a kick out of. The most important test is the kid test and all four of my boys loved it. So much so that they watched it again on Saturday. And Sunday. And I'm sure they would watch it again today if they weren't in school. Their favorite character? Anger of course, because he generally screams and yells and is just plain funny. We also loved Bing Bong, Riley's imaginary friend, played by Richard Kind. He always does a fantastic job with his characters and has a great voice. I too enjoyed the movie, though I do think it was different then the usual Disney-Pixar flick. Not in a bad way, mind you, it was just... different. I got a kick out of the way the feelings interacted with each other and how that played out for Riley in real time. Overall it was a great family movie and one I know they will continue to watch down the road. Buy it Today! 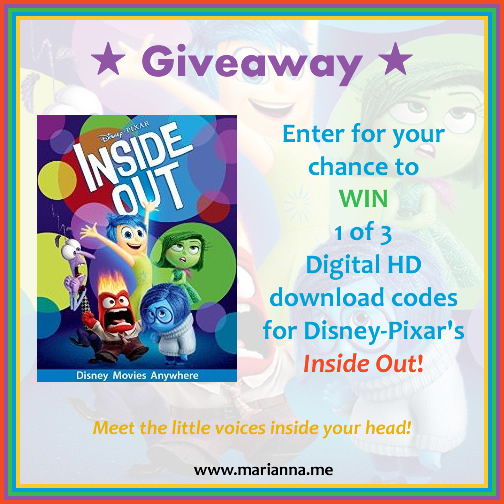 Or scroll down for your chance to win a Disney Movies Anywhere download code! 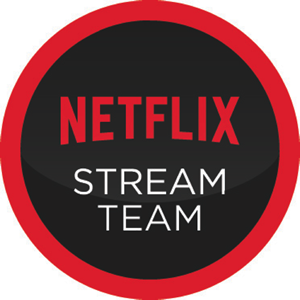 Amy Poehler (“Freebirds,” TV’s “Parks and Recreation”) as Joy; Bill Hader (Monsters University, TV’s “Saturday Night Live”) as Fear; Phyllis Smith (“Bad Teacher,” TV’s “The Office”) as Sadness; Lewis Black (“The Aristocrats,” TV’s “The Daily Show with Jon Stewart”) as Anger; Mindy Kaling (“Wreck-It Ralph,” TV’s “The Office”) as Disgust; Richard Kind (A Bug’s Life, TV’s “Spin City”) as Bing Bong; Kyle MacLachlan (TV’s “The Good Wife,” “Twin Peaks,” “Marvel’s Agents of S.H.I.E.L.D.”) as the voice of Riley’s Dad, Diane Lane (Batman vs. Superman: The Dawn of Justice, Under the Tuscan Sun, The Perfect Storm) as the voice of Riley’s Mom & Kaitlyn Dias (voice cast debut) as the voice of Riley. LAVA (Theatrical Short Film) - Inspired by the isolated beauty of tropical islands and the explosive allure of ocean volcanoes, LAVA is a musical love story that takes place over millions of years. Story of the Story - Director Pete Docter talks about the evolution of Inside Out, from the ideas and memories that inspired the story through the hurdles, explorations and experiences that helped shape it into the film it is today. • Mapping the Mind - Inside Out's artists take you through the years-long process of designing and creating a world everyone knows, but no one has ever seen - the human mind. • Our Dads, the Filmmakers - Elie Docter (daughter of director, Pete Docter) and Grace Giacchino (daughter of composer, Michael Giacchino) bring you behind the scenes for an inside look at the making of the film. I haven't see it yet but it looks really cute. Looking forward to finally checking it out! I saw it a few days ago with my kids. They really love the movie and Bing Bong. No, I have not seen Inside Out yet. I have heard good things about the movie and I would love to see it soon, especially with my nephew when he visits soon.